Real lace front wigs are some of the best-looking ones around. The way that the hairline is designed and the how they blend with your natural hair make them look really natural. 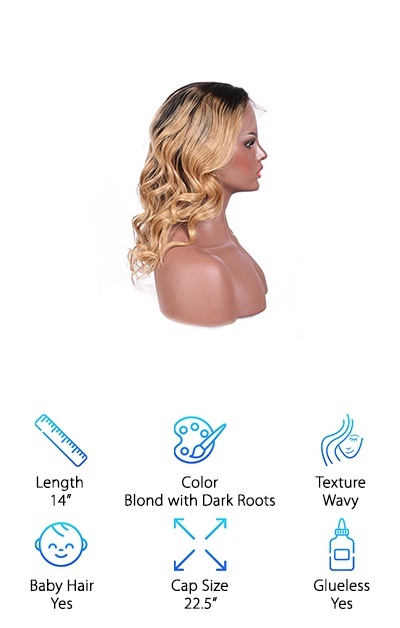 Whether you’re looking for front lace wigs cheap or even discount lace front wigs, we put in a lot of time doing research to find some of the best around. Before we get started, let’s take a closer look at some of the important features you need to know. Length: Our picks run anywhere from 8 to 16 inches. It is really all about personal preference. Just keep in mind that the longer a wig is, the more versatility you have as far as how you can style it. 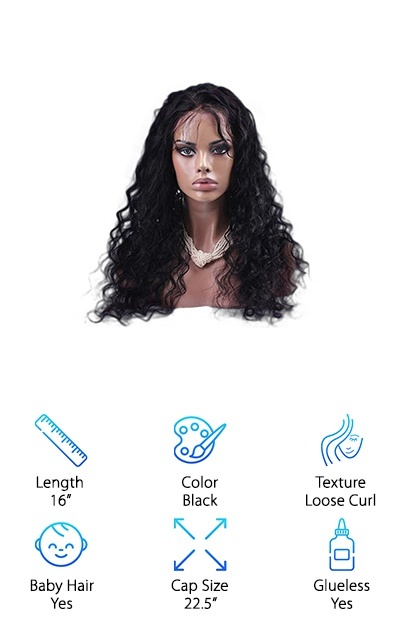 Color: These wigs come in every color you can imagine, including deep blacks and ombre shades. Keep in mind that this is natural hair. You can dye it, highlight it, or bleach it but lighter shades will take color better. Texture: Some of these come styled in wavy ringlets, short curly bobs, or even long loose curls. You can also find wigs here that are long and straight. Most of them can be styled however you want to wear them! Baby Hair: Baby hair is one of the most important features when it comes to making these wigs look natural. This mimics the small hairs around your natural hairline instead of having a sharp, stark line of hair. Cap Size: Most of these wigs come in a medium cap size around 22 - 22.5 inches. You can get larger or smaller ones, but you usually have to contact the company and to get the right size customized. Glueless: One of the best things about these wigs is that they can all be used without glue. While it varies by brand, most of them have an adjustable band and multiple combs to keep them snugly in place. 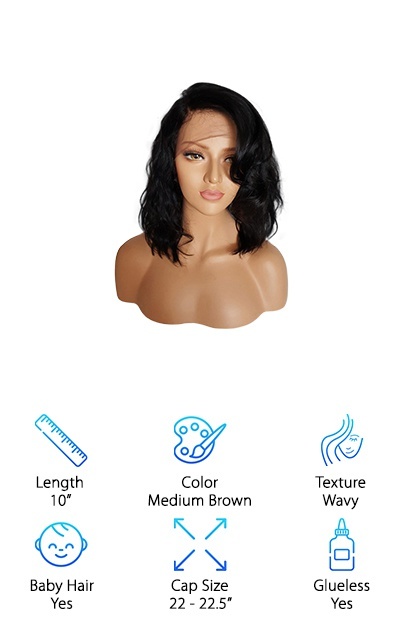 Now that you know a little more about the key features to look for when shopping for a lace front wig we can jump into our wig review. If you’re in hurry, the best place to start is with the first 2 items on our list. Those are our top and budget picks and will give you a good idea of what’s available. Stick around if you can because the rest of the top ten products are great, too. Ok, let’s go! 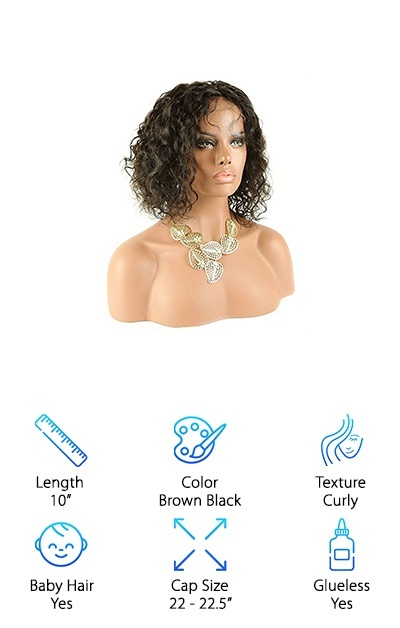 This is the best of the human hair front lace wigs we found. ZANA uses 100% virgin hair for exceptional softness. It comes pre-styled with a curling iron and has perfect waves that are smooth and soft. The color is gorgeous - medium brown ombre that’d dyed by hand in a salon. Want to know the best part? Because it’s human hair, you can cut, style, and dye it any way you want so your options are pretty much unlimited. And, because it’s 16” long, you have plenty of length to play with. It doesn’t shed or tangle and has baby hair so it looks really natural when you’re wearing it. If you don’t like it, you can easily return it as long as it’s in the original condition. Looking for the best cheap lace front wigs? ISIS Brown Sugar Wig is one of our favorites. It’s made with a mix of human and synthetic hair so you get the price of synthetic with a more natural look. It’s single knotted and hand tied. 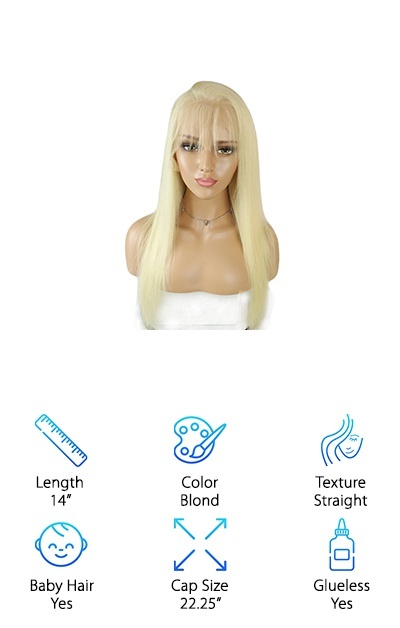 The fabric is breathable and designed so that it won’t irritate your skin or give off synthetic odors, either, making it stand out among cheap lace front wigs human hair combos. That’s not all. It comes in 4 colors: jet black, off black, gold blond, and red velvet. You don’t need to use glue, either. There are 3 combs so it’s easy to place and holds really well, especially if you have braids. You might be wondering if you can use heated styling tools. You can! Just keep it on low heat. Formal Hair is the brand to look to if you want high quality lace front wigs. This wig looks so natural, largely because it’s made with 100% real human hair. It doesn’t shed or tangle and it’s soft and really dense. It’s easy to comb and styles easily. In fact, because it’s human hair, you can style it any way you want. Curl it, straighten it, bleach it, whatever makes it fit your personal style. The 22.5” cap size is a medium and fits most women but there are small and large sizes available, too. No glue is needed. There are 3 combs, one on each side and one at the back that help keep it tight and in place. That’s not all. Every customer gets a 30-day 100% money back guarantee. KRN’s natural hair lace front wigs are soft and last a long time. They don’t shed, smell, or tangle, either, all of which make them look even more like your own hair. Because it’s human hair, you could dye it if you wanted to but we really liked the dark root to blonde ombre that it came with. The hairline looks really natural, too. One of the things that we liked most about it was that you can part it anywhere and the baby hair will still help it look completely natural. We think this has a lot to do with the fact that the hair is hand tied. That’s not all, the lace itself is high quality and won’t irritate your skin. It’s also adjustable to fit most heads easily. Looking for a different style from the wigs we covered so far? Check out this Brazilian Short Bob Wig. We were not disappointed and we know you won’t be either. It’s 100% human hair that’s soft, tangle free, and won’t shed. That also means you can style it any way you want to: curl it, straighten it, dye it, bleach it. Plus, it has baby hair so it looks even more natural when you’re wearing it because it creates a realistic looking hairline. The medium size is 22 - 22.5” but if you need something bigger or smaller, they’ll customize it just for you. These wigs go through strict quality control and don’t have any odors. Not only that, but they offer a 30-day money back guarantee on wigs that haven’t been altered. 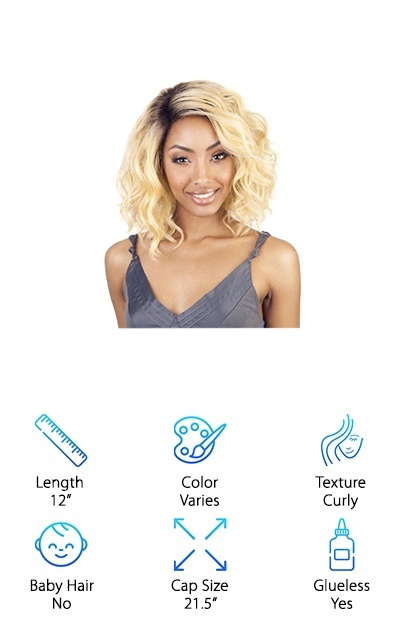 When it comes to the best human hair lace front wigs, BEEOS has the perfect short wavy option. It’s made of 100% unprocessed virgin hair that looks and feels smooth and silky. It’s glueless and the 3 combs are great at keeping everything in place. That’s not all, there’s also an adjustable strap to give you some extra hold. It’s tangle free and doesn’t shed. Here’s the best part. Because it’s made of human hair, you can treat it like real hair. That means you can cut it, perm it, dye it, or straighten it. ( Just keep in mind, like all of our picks, you can only return it if it’s unwashed and unaltered.) The standard size is a medium but if you need a small or large, BEEOS is more than happy to accommodate you. 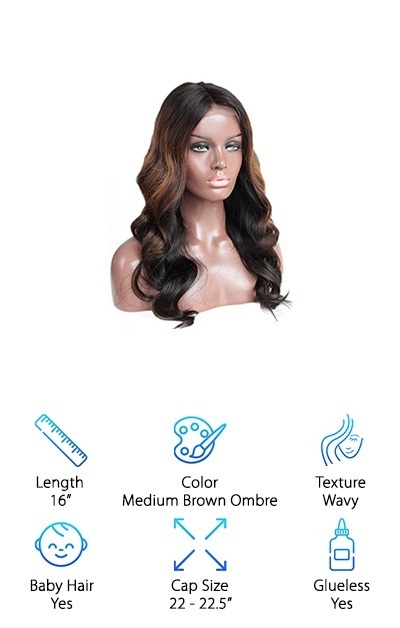 For long, straight lace front wigs, Nobel Hair has just what you’re looking for. It’s 100% blonde human hair. Because of the long, straight style and light color, this is a really versatile wig. It beautiful as it, of course, but you can color it and style it any way you want to. Just remember that it has to be in the original condition to get a full refund. 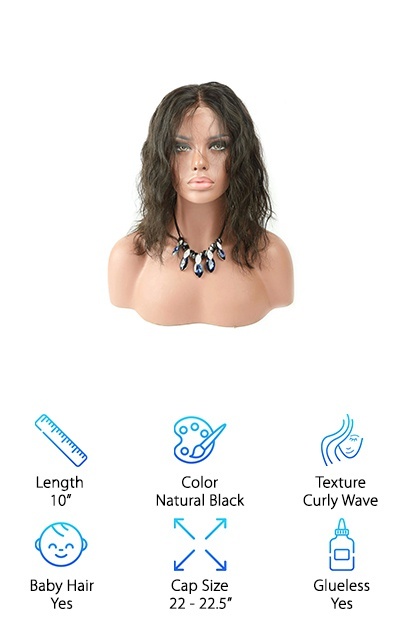 The wig is tangle free and won’t shed plus there are no weird smells or odors. These wigs are really easy to put on and comfortable to wear, too. Why? Because they’re glueless! The adjustable strap and clips do a great job of holding the wig in place. The standard size is a medium, but if you need a small or large cap, Nobel Hair can customize one for you. Looking for a longer style that still has a lot of volume? 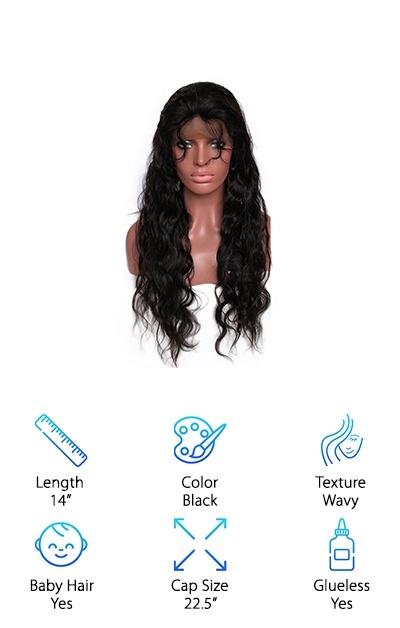 This body wave styled wig from Melon Hair has a deep texture that really amps up the volume. It’s made of 100% virgin human hair and can be dyed and bleached just as you would your real hair. In order to make it look even more natural, baby hair is placed around the whole perimeter. There’s no need to use any glue either. The cap has an adjustable elastic around the inside plus 4 combs - one in the front, one in the back and one on each side - that keep this wig in place. There’s little shedding and the hair is nice and soft. You can even use a straightener or curling iron on it to make your own style. 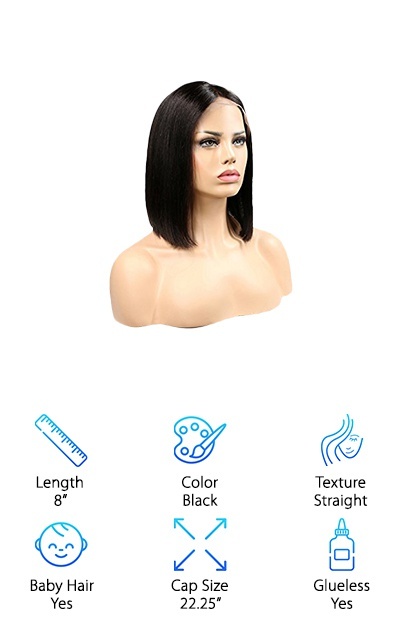 We definitely wouldn’t call this one of the cheap lace front wigs human hair, but it’s a reasonable price for the product you get! V-Emma uses 100% human hair and does strict quality control so you know you’re getting the best product possible. It has a really nice feel, very soft and silky. Half of the production is done by machine and half by hand and you don’t have to worry about any shedding or tangling. Something we really liked about this one is that you can pick where you want the part. It comes on the side but if you want it in the middle, 3 part, or one on the other side, you can request it. One more thing: as long as the wig is in its original condition, you can return it within 15 days for a complete refund. For one of the best short lace front wigs human hair combos we found, take a look at this short curly wave bob from Formal Hair. It’s made with 100% human hair that’s soft, tangle-free, and doesn’t shed. And it doesn’t have any of the odors that you can get with some wigs. That’s not all, it’s also easy to comb and style. Because it’s human hair, it can be curled and straightened. To create a more natural hairline, it has baby hair around the perimeter. You don’t need glue with this one, either, the adjustable straps and combs keep it nice and secure. The brand does thorough quality checks to make sure everything is the best it can be and they even offer a 30-day money back guarantee.